Mary Drain Albro = She researched Oregon Trail pioneer roses and installed the Pioneer Rose Garden in Block 22; is buried in Rose City Park Cemetery. Georgiana Pittock = She was captured by Indians as child on the Oregon Trail. She married Henry Pittock and was the founder of the Rose Festival. Her body was moved to Riverview Cemetery. 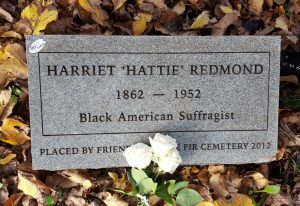 Harriet Redmond = The famous African-American suffragist from Oregon, Hattie Redmond, was born Harriet Crawford in 1862, or 1863. Her parents were slaves, Reuben Crawford, her father, was a rope-maker and later a ships’ caulker, and her mother was Vina Blue. Hattie, being the oldest of eight children, helped her mother in caring for her siblings, as the family made frequent moves from the East Coast, then to St. Louis, San Francisco, and finally settled down in Portland, Oregon around 1880.